There’s no fool like an old fool and today I’m that man. I’ve been smitten like a freshman by one Sara Scuderi who, sadly, has been dead and gone 27 years. You see Sara is (or was) an opera singer... a soprano in fact... whose best years were in the 1930s and who was most famous for her performances as Tosca, the heroine of Giacomo Puccini’s opera of the same name. Before the final curtain, Tosca will fall in love with the handsome Mario, kill the evil Scarpio, witness Mario’s execution and cast herself from the castle’s parapet. So there’s love, betrayal, murder, suicide and of course the soprano tragically dies in the end. All standard operatic fare. But why Scuderi and why now? 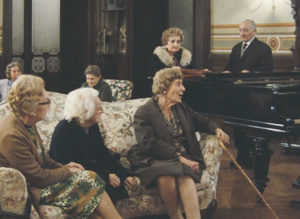 It’s because I’ve just seen Tosca’s Kiss, director Daniel Schmid’s wonderful 1984 documentary about Giuseppe Verde’s Casa de Riposa, a retirement home for opera singers and musicians in Milan, Italy. 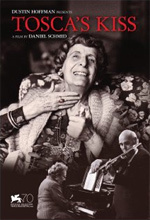 The film has been restored and released as a DVD by Icarus Films and it is of interest to the modern film audience as the inspiration for Dustin Hoffman’s directorial debut film Quartet. Indeed Hoffman is credited on the disk with presenting this restored version of Tosca’s Kiss. Sara Scuderi was one of the residents at the Casa de Riposa and her delightful bell-like laugh hit me squarely in the heart. Sara was 81 at the time Tosca’s Kiss was filmed (she died in 1987) and though frail, was still capable of hitting a dramatic note and sustaining an aria. Around her, the other residents are also in decline yet still have their own flashes of brilliance of mind and operatic athleticism. For people who were once at the top of their game but now live lives of faded memories and delve in trunks full of worn-out costumes, they still seem to be satisfied with their lives. Is this because they are Italian and come to old age with a fuller and more realistic understanding of life? Or maybe having been on the summit once in a lifetime is enough. The only grousing heard is about how opera has declined in the years since they retired.... the classic complaint of the elderly. Tosca’s Kiss is a stream of musical vignettes interspersed with scenes of the old artists reminiscing and even performing past roles. The film is poignant and charming throughout. Whether it is Schmid’s good filmmaking or the acting talents of the residents is hard to say. I suspect that Shmid, in offering them a stage on which to act (opera being after all theater with singing), they rose to the occasion one more time for what was no doubt their last performance. I don’t think you have be an opera aficionado to appreciate this film (though a little love of the opera will make it an even more satisfying experience). Tosca’s Kiss is a very special little film and I’m not saying that just because Sarah Scuderi is in it. But still,... sigh, bravo Sarah, bravo!